In Visual Paradigm, design pattern is a part of diagram that can be used in many different diagrams, thus form a pattern. Design pattern typically shows the shapes and more importantly, the relationships between the shapes. You can define and reuse design pattern in your project, across projects or share with your team members. You can define and apply design patterns on any kinds of diagram. In order to apply a pattern, you need to define it first and save it as a pattern file ready for being used. To define a pattern, draw the pattern on diagram. After that, you can save the pattern, which is the diagram content as a pattern file. In the diagram where the pattern was drew, select the shapes to be involved in pattern. 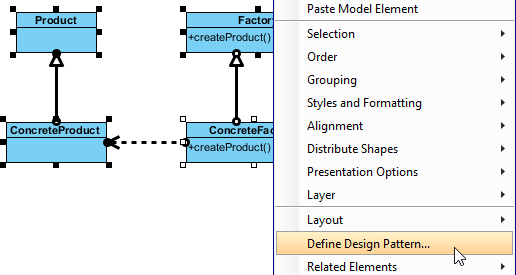 Right click on any selected shapes, select Define Design Pattern... from the popup menu. A design pattern is needed to save as a file. In the Define Design Pattern window, specify the name and file name for the pattern, with .pat as extension. You can save the pattern file to workspace for ease of sharing with other projects that will be opened in current workspace. Besides, you can save to another directory and share the .pat file with your team member for reusing. Click OK button to finish defining design pattern.